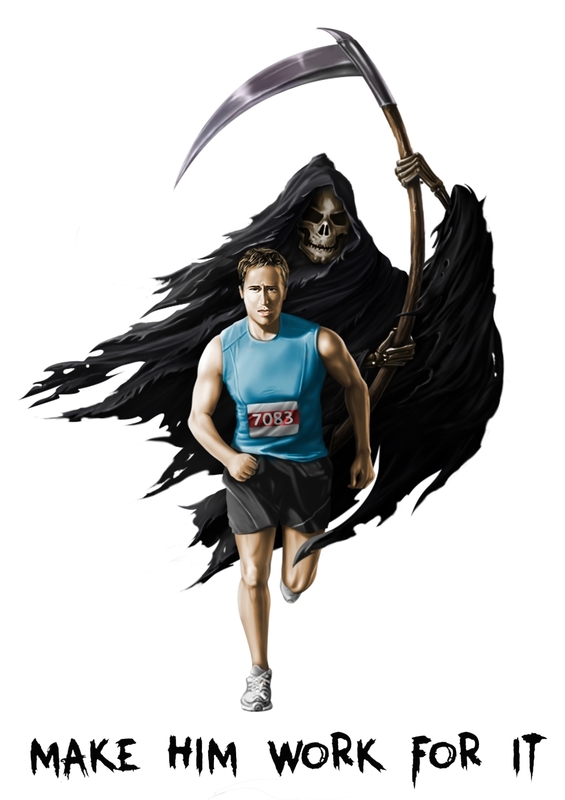 WASHINGTON, D.C. – We all know how easy it is to let fitness slip, especially at a certain age, but the threat of the Grim Reaper can be a strong motivator to stay or get in shape. With the goal of creating a college fund for the now 8-year-old daughter of a terminally ill fellow runner, MakeHimWork t-shirts advocate the importance of sticking to an active and healthy lifestyle to make the Reaper’s job just a little bit harder. 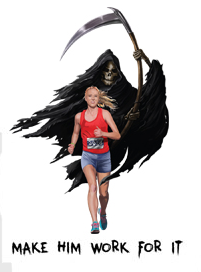 Created by Potomac lawyer turned legal headhunter and longtime runner, David Landau, 60, the shirts depict how close the Grim Reaper is to catching up to each of us. The design promotes the value of exercising and eating right, while also reflecting a sense of humor, as it shows a hardworking runner leaving the Reaper, a representation of mortality, in the dust. 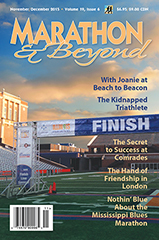 While Landau’s promotion of good health is certainly commendable, his compassion for—and generosity toward—a fellow runner whom he had never met until a couple of years ago is remarkable. He saw a story in the Wall Street Journal about Iram Leon, a 34-year-old runner with incurable brain cancer—and his then 6-year-old daughter, Kiana. Leon had run a marathon while pushing his only child in a stroller, and ended up winning the race. Landau was so impressed—and inspired—by the story, he reached out to the former juvenile corrections officer from Austin, TX and the two have been close friends ever since. In fact, Leon is expected in the D.C.-area in early June and will be staying at Landau’s home in Potomac. As a result of Leon’s incredibly positive outlook on life and their newly-formed friendship, Landau made the decision to donate all of the profits from the sale of MakeHimWork’s shirts to a college fund he has created for Kiana. 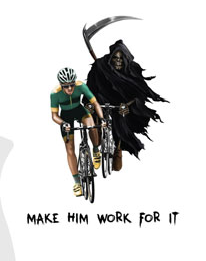 Like Leon, who wears the t-shirt for many of his races, thousands of runners, bicyclists, swimmers and other athletes around the country advocate MakeHimWork’s message and share the belief that being fit is likely to allow them to stay ahead of the Grim Reaper for as long as possible. Men’s and women’s “MakeHimWork” Dry Fit t-shirts are available online at www.makehimwork.com for $24.95 each. Cost includes shipping & handling.